Against my usual mis-givings, Simon convinced me to try somewhere different for brunch on Sunday. And, joy of joys, it was GOOD! Yay! Revel on K road was the destination, and admittedly, we didn't order cooked breakfasts, so we're possibly not comparing apples with apples, but it was certainly excellent enough to warrant a return visit! Wehoo! I had a long black - which was deliciously strong, without being burnt, and didn't require even a hint of sugar. Simon's Latte looked delicious. I also had a berry smoothie. OMG!!!!! Seriously - BEST smoothie ever! Extremely thick - in fact I was given both a straw and a spoon - and definitely needed the spoon! Simon had the fresh fruit with berries and yoghurt - this was an artfully presented cacophony of fresh fruits and berries, and the yoghurt nicely finished with a swirl of honey. I ordered a bagel with Tomato and Avocado which also came with what I think was cream cheese, but its texture wasn't quite as smooth and it had a more cheesey flavour than cc. It was delicious! The staff were all friendly and relaxed, and the service was really quick. The decor and ambiance is very funky, a bit alternative, relaxingly laid back. We had a most divine meal last night. Oh my word. Red is one of several restaurants that do a degustation menu, so they're on our list of places to visit for a wedding anniversary eventually. But last night we decided to sample their standard menu. Wow! Simon - Duck Breast for 1st course and Venison Denver Leg for main, followed by hand rolled chocolates for dessert. Every course was delicious, the salad with the duck was absolutely divine. Simon - Burnt Spur Pinot Noir, Martinborough - this was a fantastic wine. Jane - Coopers Creek Chardonnay - lovely. Loved the simplicity and style of the decor, and the atmosphere was great - we arrived quite early and at that stage there were only 3 tables occupied (including our own), but by the time we left at 9pm, the place was full to overflowing. This was really good! Mains were approaching $30, sweets were all less than $15. And everything was well worth it. Well, Simon enjoyed Red so much, he has now declared it one of his top 4 restaurants (including Ciao, White and the French Cafe). I would have to agree. Just a quick post for now - we haven't lost interest and given up on our blog yet! We've just had nothing of note to post. Scrambled eggs on toast, bbq scotch fillet, curry, tomato sandwiches - it's been one of those weeks. We're planning our part of Christmas dinner at the moment. We're responsible for one meat (yes, there will be multiple meats at our Christmas dinner) and starch in whatever form we choose. So Liz's splendid German potato salad it is - that way I can make it on Saturday and not need to take up any kitchen space on Christmas day, and we're thinking we'll get some bbq-able organic meat from Zakar (they don't have a website!!! (but they do deliver - Yay!)). Oooh, actually here's an article about them - Zakar Certified Organic Beef or you could head to the Clevedon Farmers Market - which is where we found and fell in love with them. Seriously - the BEST beef sausages we've ever eaten. Oh my word, 3 posts in one day!!! Too scarey. 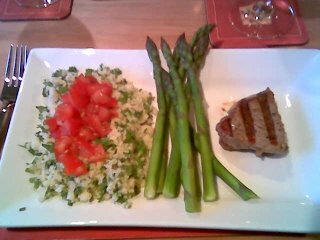 Had another lovely meal at home tonight - once again sticking to our theme of simple food, high quality ingredients, and healthy eating. 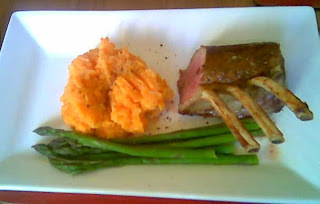 So we have a kumara mash, cooked in Tangelo juice and with a sprinkling of Maldon salt and freshly cracked black pepper, rack of lamb coated in a Morrocan rub and of course, my favourite (but not Simon's) asparagus. Divine. I had a meeting in the Viaduct area yesterday, and decided to pop into Mecca down in the Viaduct with a colleague for a quick bite for lunch. I decided to have Salt and Pepper Squid and my colleague had a Lasagna. We both enjoyed our meals, they arrived in a timely manner, the wait staff were courteous, and there was a good ambience about the place. My squid was super tender and was a reasonable sized portion. Apart from the slightly inflated prices (as expected in the Viaduct), we were a bit annoyed that when we asked for water we were presented with mineral water, which as we found out later was $7.50 . It is not the cost of it I care about, but more that when I ask for water I expect that by default it is (free) tap water and they can then upsell from there to mineral or sparkling water. Other than that, a fine experience and I would defintely go back. We used another of our Entertainment Book vouchers yesterday and had lunch at Deve Cafe in Kingsland. Gorgeous old building complete with photos of 'as it was'. Love the lamp shades - all were prints of nature artwork they had on display, made into lamp shades. Very cool. As for the food and coffee, we both had open sandwiches - Simon the Moroccan lamb and I had the Cajun Chicken. Simon's seemed to be pretty good, although quite lightly spiced, mine was ok, but a weird variety of flavours. Cajun, jalapeño, gruyere cheese and tomato salsa. Very odd. Coffee was Allpress, however not what we're used to when we get it from Benediction. It wasn't burnt, but definitely a bitter tang to it and mine (long black) was quite 'thin' on overall flavour. Nice to receive water at the table without asking, and likewise to have it replaced when we emptied the bottle. All in all, if we're in the area, and if we've tried all the other yummy looking cafe's on the street, yes, we'd go back. But definitely not on our favourite list. We decided to plan to go out for dinner tonight. So we planned it one hour in advance instead of our usual 40 minutes in advance. :) Fortunately, Ciao even had a table available (although Orbit didn't). In a nutshell - divine! Simon decided that this was one of his top two dining experiences this year! 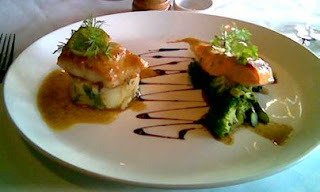 The atmosphere, as always, was great; service and attention to detail - flawless; presentation and taste - to die for. Oh my word, to die for and then some. We started with a gorgeous tomato, mozarella and basil salad (see pic below) - the tomatoes and cheese are both imported from Italy for this dish. 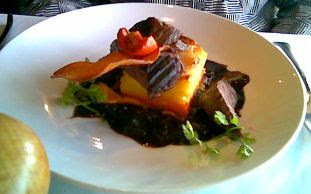 Next, Simon had the Ciao Qua Qua - orange duck, and it was delicious, and a work of art! I had the Agnello - rack of lamb. This was heaven. The mash was creamy and full of flavour - full of fresh thyme. The lamb itself, and I pride myself on doing a great rack of lamb, was one of the best I've had. It was packed full of flavour, very tender and very lean. To accompany, we both had Italian wines. Simon had a Sicilian Merlot (2001!) and I had a Cabernet, Sangiovese (2004) from who knows where! We both went on the waitresses recommenddations, so I didn't actually catch the label of either of these. They were both very dry wines, but absolutely beautiful, and a splendid match with our meals. Instead of finishing with dessert, we each had an affogato - and they were lovely. 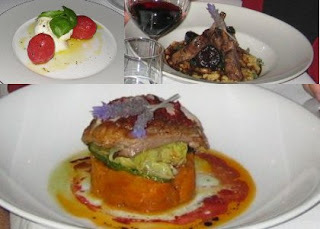 So yes, a splendid meal, 10 out of 10 - as I expect from Ciao, although tonight it even exceeded my expectations. Oh - and I am delighted to see that they have extended their 'requires 3 days notice' menu. Yay! We will have to get organised some time and plan days ahead and partake of hare or pheasant or one of their other very special dishes. For the month of Movember I grew a Mo. This was the first time I had grown my facial hair for longer than a few days, so it took a bit of getting used to (for me & Jane). At the beginning of the month when I told Jane (via IM) that I was going to grow a Mo for Movember I can recall a reply of NOOOOOOOOOOOOO, but now that she has had to persevere with me having it for a month I don't think she has quite as strong an objection to it. One of the more challenging things with growing the Mo was deciding how to shape it. I decided I didn't want a bland Mo, but one with a bit of character (and ugliness). In terms of what I ended up with I was reasonably happy with; it was a bit messy but I wanted to maximise my growth opportunities. Having hair on my upper lip (in particular the hairs that were on the fringe of my month) is something I never got used to; they just kept getting in the way! Having said that, I didn't have too many problems with food getting stuck in my hairs. There were also some warm days in November this year and having facial hair didn't help. I can't imagine going through a whole of sumner with that additional warmth (so I won't). It was all for a good cause (the prostate cancer foundation) and I raised $100. A big thankyou goes out to those of you that supported me. So, in terms of whether I would I do it again, Maybe.